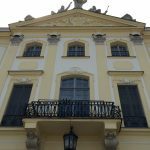 – Running trains from Bialystok to Kaunas is a very important step in establishing good neighbourly relations. 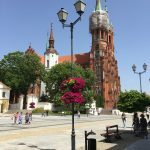 I hope that due to the competitive ticket prices and attractive travel time a new connection will meet with the interest of the region’s inhabitants and tourists– says Krzysztof Mamiński, Chairman of the Board – Director General of Regional Transports. – The last time travellers from Polish Lithuania came direct train on the track normal in 1939. After such a long break to resume rail link between our two countries is an important strategic move for both sides. The more that use European track “Rail Baltici.” This important agreement will create for our passengers quick and convenient to reach by train to Europe – says Stasys Dailydka, CEO of Lithuanian Railways. The trains will operate from Friday through Monday aimed at the tourist sector. The journey is scheduled to take 5 hours. 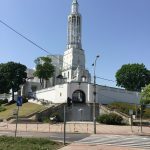 The one-way ticket from Bialystok to Kaunas is priced at €11, I bought my ticket online beforehand and I am glad I did as there was a lengthy queue at the Bialystok ticket office. 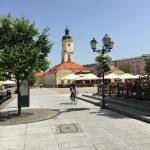 I was lucky enough to travel on the inaugural service from Bialystok on Friday 17th June and the following are my experience / impressions. 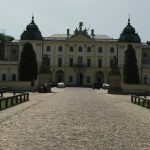 Bialystok in Eastern Poland is a great city to break a journey as it has enough to keep one occupied for a day and a night. 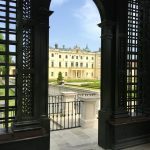 The compact city centre features the impressive 18th century baroque Branicki Palace, also known as the Versailles of Podlaskie, and for the evening a stroll along Warszawska St with its beautiful buildings, bars and restaurants. 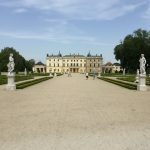 Unfortunately for me I was on a tight schedule and could not stay overnight but I did explore for 4 hours after arriving from Warsaw, some 2 hours away. The station is close to the city centre and has left luggage lockers making it a train stopover dream! The train itself linking Bialystok and Kaunas is a two car diesel train provided by Polish Railways. 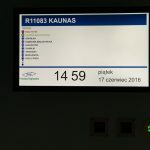 Clearly some thought has gone into this new service as all signs on the train were in Polish and Lithuanian as were the on-board recorded announcements. The train is 2nd class only, air conditioned, fairly comfortable (seats a little hard for a long journey) and impeccably clean, including the toilet. With this being the inaugural train there was some media attention with a TV crew and a radio station doing interviews, including interviewing a very proud looking driver. The train left on time and made its way through rural Eastern Poland with lots of trees en route, in fact on this trip too many trees… An hour or so into the journey there was a very short but intense storm with very heavy rain and strong winds, it lasted for only 5 minutes but this was long enough to cause havoc. Many trees had been snapped or blown over and one had landed across the line ahead blocking it and another had landed and brought down the overhead electric wires down so it was too dangerous for the train crew to attempt to move the trees. 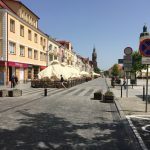 Eastern Poland is not the most densely populated of areas and the closest help was back in Bialystok so we had to wait for 2 hours for two sets of help to arrive – one lot to fix the overhead electric wires and the other to chop and clear the trees. The Polish crew on the train did not speak English and I have to admit my Polish is non-existent but it was obvious what was happening as the trees were about 100 meters in front of the train. Some passengers gave up on the journey and made calls to be picked up. After another 30 minutes the train was on its way again. 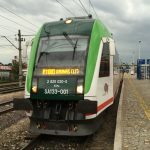 The train dropped off passengers at stations as far as Sulwaki, where the rest of the passengers got off except for 1 other solo passenger and a family of 5 who were travelling from Warsaw to Tallinn! The scenery from Sulwaki onwards towards Lithuania was very pastoral with rolling green hills and lots of cows, many of which lifted their heads to watch the train pass by. At Trakiszki the train crew changed with the Lithuanian crew taking over. 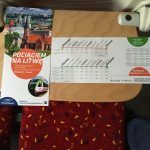 The Lithuanians were very excited about their new service and came to check tickets and were intrigued that I had an e-ticket issued through Polish Railways, they said they had never seen one (of course this one this the very first service…) and asked if they could keep the ticket. 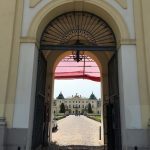 The guard advised that we would be arriving into Kaunas at midnight and aksed if I was travelling on to Vilnius, which I wasn’t, the asked which hotel I was staying in and advised to take a taxi for €4 as it would be safer. The journey from Sestokai onwards was on the relaid railway alignment with the two lines of different guages running parallel. Speeds of the train were not as quick as I expected of a new railway but there are lots of level crossings which limit speed. The other surprise was that the line was not electrified. About 20 minutes out from Kaunas I went to ask the guard if she knew the exact time of arrival and she confirmed midnight. 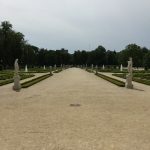 The guard was chatting to two other members of staff and a passenger who said to me in English that he was staying close to my hotel and that the guard’s husband would drop us off – what excellent customer service! 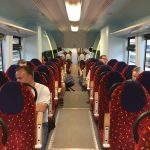 The other passenger was a Polish train enthusiast who had just returned to Poland after studying and working in Scotland for 7 years, and had picked up the accent, and was working for a company designing apps for Polish Railways. 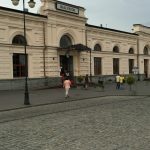 We rolled into a very deserted Kaunas station at midnight and were met with the flash of a camera – the guards husband was taking the pictures of her arriving on the inuagral service. 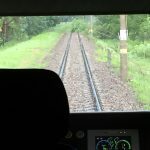 Despite the tree incident and delay the overall trip was fun and the enthusiam of the train crews and the kindness shown by the Lithuianian guard added to the trip. thanks for sharing your great insights to the Bialystok to Kaunas railway. Thank god nothing serious happened during the storm! 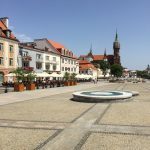 One month ago, I used the connection from Lithuania to Poland – fortunately, the weather was less dramatic.